OKS is able to reform your production process in the shortest period of time. In one case, we succeeded in establishing a machining line for high-mix variable-volume production in only three months. Our expertise, which is cultivated in our office culture has proved indispensable in assisting the speedy reforms. While the utilization technology for devices and systems has been enhanced for production it remains a difficult task to materialize and share the intangible experiences and feelings of actual working engineers. Therefore, worker knowledge remains silent in the case of most manufacturers so while skillful engineers are necessary, depending on them can be a serious risk. Since the 1980s when the term“knowledge management”was yet to be coined, OKS analyzed a wide variety of expert data related to fixture systems, which had been accumulated by working engineers. This expertise was then converted into standardized drawings and workflows. At the same time, OKS also introduced IT technologies with a pioneering spirit to digitize the information. As a result, sharing and using knowledge is now possible and has led to an overall improvement in the quality of proposals as well as a reduction in introduction lead times. OKS implements knowledge management not only for manufacturing expertise but also for proposal images. We assist our customers in making accurate decisions in a swift manner by visualizing the manufacturing processes as well as line layouts. Standardizing knowledge from working engineers. Manufacturing is a world of mastery. In the manufacturing industry, most of the experiences and insights accumulated by engineers over the years are implicit and can only be passed on from person to person. Yet, OKS has defied this conventional thinking and promoted knowledge management which converts this intangibile knowledge into standardized drawings and workflows. A large number of drawings in a library. Since fixtures vary depending on the product types, a large number of drawings are stored in OKS offices. When an order for a new item is received, there are always case studies which serve as useful references. This large archive of such reference information continues to assist in the speedy commercialization of high-quality fixtures. Collaborating with companies specializing in 3D modeling has proven to be a real advantage for OKS. With the use of computer graphic models, we have been able to visualize machining lines and products immediately after a consultation. In turn, this has enabled OKS to better assist customers by showing truly rendered images to ensure better decisions. Left: Checking work procedures after an introduction with video clips. Right: Visualization of completion images in 3D. 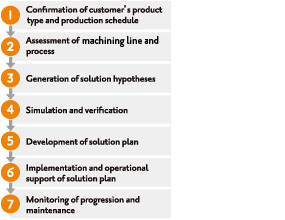 OKS has set seven processes in order to seamlessly provide solutions and improve production fields in a shorter time. For example, the Baby Kangaroo System (Quick Fixture Change System) can be introduced in three months on an average.